I stumbled upon Mr. and Mrs. Green when my children were learning to read. 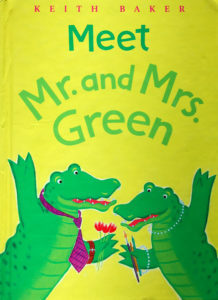 These alligators are fun, quirky characters presented through mini stories (3 per book) and colorful illustrations. Mrs. Green suggests that they go camping. They plan what to bring - Mrs. Green says they need warm clothing, and Mr. Green suggests bunny slippers. Mr. Green feels scared, and worried about mosquitoes (he hates mosquitoes). Mrs. Green makes a map that leads them past familiar places and ends at a comfy spot in their own back yard. Other adventures involve Mr. Green attempting to eat 100 pancakes (with butter, syrup, and rainbow sprinkles) and the characters participating in a county fair. This is an excellent book for beginning readers - with interesting, sometimes silly situations, and likeable characters.